Analysis: A premature declaration of victory in Syria? Note: This article was first published by The Weekly Standard. If the Trump administration’s latest rhetoric sounds familiar, that’s because it is. President Obama and his advisers drastically underestimated ISIS and its predecessor organization, referring to the group as the “jayvee” team of terrorism and acting as if it were a purely “local” concern. During the 2012 presidential campaign, Obama claimed to have brought the Iraq war to a “responsible end” by withdrawing the last of America’s forces in December 2011. Obama desperately wanted others to take the lead in fighting the jihadists in Iraq. But the hasty U.S. withdrawal, driven in part by political concerns, paved the way for ISIS’s surge. By mid-2014, ISIS had seized large amounts of territory across Iraq and Syria, declared itself to be a caliphate, and mushroomed into an international menace. Trump risks falling into the same trap as his predecessor. The president is clearly itching to declare victory over ISIS in Syria. But a retreat from Syria right now would only give ISIS room to survive and possibly grow once again. ISIS isn’t finished in Syria—or Iraq. The latter country wasn’t even mentioned in the White House’s statement. And Abu Bakr al-Baghdadi’s zealots still maintain a cohesive global network outside of those two countries. As ISIS began to lose its grip on its capital city of Raqqa and the surrounding areas of northern Syria, some of its most senior figures were relocated to a string of towns nestled along the Euphrates River in Syria’s eastern Deir Ezzor Province. The U.S.-led coalition adjusted accordingly. Since early 2017, the United States and its allies have conducted a series of special forces raids and drone strikes against high-ranking ISIS commanders in Al Mayadin and the surrounding river towns. These operations successfully eliminated jihadists who were responsible for planning terror attacks around the world, as well as commanding guerrilla forces in Iraq and Syria. Simultaneously, the U.S.-backed Syrian Democratic Forces (SDF) pushed into Deir Ezzor, pinning down many ISIS fighters. The noose was tightening on ISIS in eastern Syria until Turkey launched “Operation Olive Branch” in northern Syria in January. The Turkish offensive was intended to roll back Kurdish militiamen belonging to the People’s Protection Units (YPG), which is affiliated with the Kurdistan Workers’ party (PKK), a U.S.-designated terrorist group. SDF fighters, many of whom are also members of the YPG/PKK, left the frontlines against ISIS in eastern Syria to help their Kurdish brethren in Afrin. This forced the Pentagon to concede in early March that the anti-ISIS campaign had entered an “operational pause”—a phrase that does not speak to an impending victory. This sequence of events demonstrates the perils of relying on others to direct the war against ISIS. The rival anti-ISIS parties operating in Syria have competing agendas, and it is only the U.S. presence that keeps them focused on the caliphate’s loyalists. And ISIS has demonstrated a significant war-fighting capacity in Deir Ezzor since the unintended “pause” in the American-led campaign earlier this year. The group’s Wilayat Furat (or “Euphrates Province”) regularly releases propaganda that glorifies the jihadists’ targeting of fighters loyal to Bashar al-Assad’s regime. 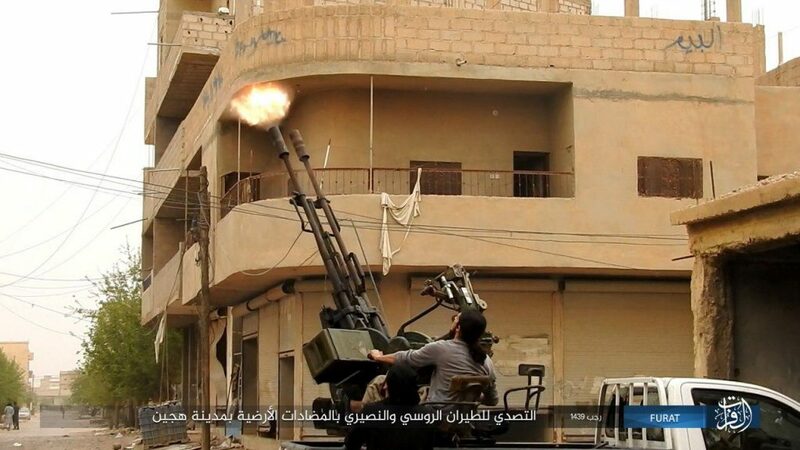 The scenes often feature ISIS members firing Soviet-style SPG-9s (recoilless guns mounted on tripods) or antiaircraft artillery, killing Syrian soldiers, or detonating explosives. ISIS’s Wilayat Furat still has the time to advertise its nascent governance and proselytization efforts as well. ISIS operates elsewhere in Syria, too. The Khalid ibn al-Walid Army, which is openly loyal to Baghdadi, fights both the Assad regime and rival insurgents in the area surrounding Damascus. Other ISIS units conduct attacks in northern Syria. Although the White House statement didn’t mention Iraq, ISIS hasn’t been completely defeated in that country either. The so-called caliphate straddled both countries at the peak of its power, so the omission is odd—to say the least. Several areas of Iraq are still infested with ISIS members, including the disputed Kirkuk Province, which the Iraqi government and Kurdish forces fought over last year. Unnamed Iraqi officials recently told the Associated Press that ISIS has killed “between 150 and 200 members of the [Iraqi] security forces…across the country in the past few months.” Indeed, ISIS claims to have killed or wounded dozens of Iraqi security officials in Kirkuk alone since last December. In recent weeks, ISIS has set up fake security checkpoints, burned the houses of its rivals, detonated suicide car bombs, and assassinated officials in Kirkuk Province. Late last month, nine federal policemen were captured along a road from Kirkuk to Baghdad and then executed. In other areas of Iraq, such as in Diyala and Anbar provinces, there are indications ISIS has increased its operational tempo. Outside of Iraq and Syria, ISIS branches conduct regular attacks in several jihadist hotspots, including Afghanistan, Somalia, the Sinai, West Africa, and Yemen. There are strong indications that ISIS retains a significant presence in Libya and the Philippines, despite setbacks in both countries. There is no question that ISIS has suffered great losses since the zenith of its power in 2014. But the White House is exaggerating the group’s weakness. The White House also said nothing in its statement about al Qaeda or the group known as Hayat Tahrir al-Sham. But chances are that these jihadists in northwestern Syria, who are opposed to ISIS and have been targeted by the U.S. in the past, will require America’s attention in the future. We’ve already seen what happens when a president wants to declare a mission accomplished before it is. ISIS and al Qaeda have bounced back before. It would be a mistake to give them room to expand their operations once again. Barack Obama did the same thing in 2011 over in Iraq. In my father’s Marine Corps, it was called a “bug-out”. “Cut and run” is a far gentler way to put it. I’m beginning to (warily) think of Trump (whom I voted for) as something of an Andrew Jackson. Disagree with the assessment of our government’s assessment. Even though we say otherwise, I don’t think anyone is of the illusion that this is over with ISIS. It is more a reflection of facts on the ground. Syria is getting uglier by the minute: Assad is more secure in the areas he holds; however, the Sunni militants are being defeated but not destroyed, just moved to Idlib for a big show-down there someday; the Turks are getting more confident, weakening the Kurds (now a dead-ender for us), and probably strengthening the Sunnis, perhaps perpetuating that conflict indefinitely, should the Turks get comfortable in the north. We don’t have a stake, or anything to gain, other than picking off bad Sunnis. Why stay? I understand the counterfactual argument that a residual U.S. military force in Iraq would have prevented the rise of ISIS, but I don’t fully believe it and have never heard it argued in detail. Wasn’t Iranian influence and Sunni-Shia strife already growing even under the U.S. occupation? How many U.S. troops would have been required to prevent the emergence of ISIS and what military operations would they have conducted to do so? How would the political and socioeconomic foundations of ISIS among Iraqi Sunnis have been addressed – indeed, how will they be addressed today? Is the issue better left to local actors, non-governmental organizations, and international institutions? Does it require more political and economic measures than military? Might Iran play a constructive or at least necessary role? I think the issue of the continuing indigenous Syrian insurgency, including al-Qaeda affiliated elements, is very important and I’m glad that is mentioned in the analysis. The same goes for the ISIS-affiliated groups in other countries, including Boko Haram, Sinai Province, Abu Sayyaf, Khorasan Province, Caucasus Emirate, and others. Another question is, where and how will the next generation of jihadist groups emerge? Might it happen under the al-Qaeda banner?